Spicy, sweet, creamy, tangy… when a salad is this packed with flavour, there’s nothing ‘side’ about it. This dish is worthy of being the main attraction at dinner tonight. 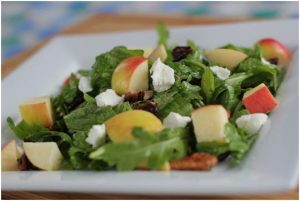 We were inspired by the Kitchen Alchemist and her recipe for Awesome Arugula Ambrosia Apple Salad with Glazed Pecans. We simplified things a bit and skipped the glaze on our pecans to make it a bit healthier (and also because we think Ambrosia apples bring enough sweetness to the dish). You can use her recipe for glazed pecans if you want but here’s how we built our delicious dinner salad. Grab a heaping of freshly picked arugula (from your own garden, if you’re lucky enough) and give them a good cold rinse. Once they’re dry again, lightly dress them with olive oil and apple cider vinegar. Don’t overdo it with the dressing or you’ll cover up the pepper of the arugula which sets off the sweetness of the Ambrosia. This is your leafy base. Now for the toppings! You can get creative here with nuts and seeds that you love. We used pecans (lightly toasted), chia seeds and local, dried sour cherries. Next step is to dice up a crispy Ambrosia apple. You want the chunks to be at least half an inch cubed because the Ambrosia is the star of the show, of course. The Kitchen Alchemist suggested topping the salad with homemade cashew chèvre but we just used a few pinches of locally-produced, goat chèvre and it worked out perfectly. Chèvre can be a bit of strong taste (especially for young palates) which means not everyone is a fan. If that’s the case in your family, you could try quark, feta or parmesan petals instead. If you want to keep this recipe vegan, give the cashew chèvre a try! We were fortunate enough to still have some fresh Ambrosia apples from last harvest but if you don’t have those, you can certainly chop up some dehydrated Ambrosia apples. We bet that would be tasty too. Did you give this recipe a try? We’d love to hear about how it worked out or, even better, see it! Share your experience with us on Twitter, Facebook, Pinterest and Instagram!